Cordless blinds are safer for kids and pets. 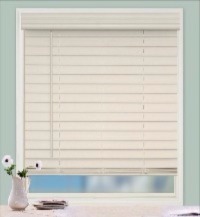 These blinds have no dangling cords providing more stylish and cleaner look to your window decor. This new line of faux wood blinds are budget-friendly, yet the quality of the blinds are not compromised. Window blinds are the most popular solution for light control and privacy. They are easy to install and almost maintenance-free.